The LED lighting systems made by daytime offer an unbelievable variety of possible combinations. Individual solutions are available for each and every aquarium, with various options for illuminance, mounting style, light color and control. To keep you on track we will show you in this manual how to assemble a daytime matrix light for your tank. What is a matrix LED light composed of? The body of the lamp consists of an aluminium rail. These rails are available in different sizes and should always be chosen according to the size of the aquarium. Depending on the length of the rail, a varying number of matrix modules can be mounted. Each module is equipped with LED lights, consumes 10 watts and delivers approximately 1,800 lumens. The light color can be selected from a variety of colors. 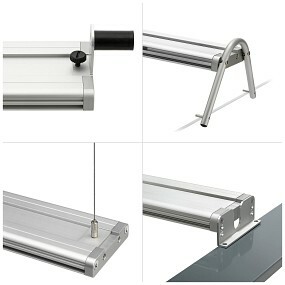 Various mounting options are available for this lighting system. A universal holder in the form of extendable holding pins is integrated in the rail. 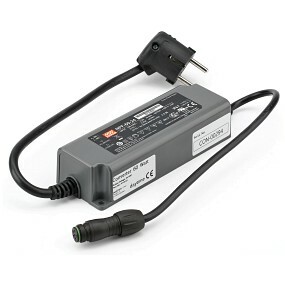 To power the LED light, you’ll need the right power supply unit (converter) with 24 V.
Basically, there are two structural conditions that dictate the configuration of your matrix LED lamp: for once, this is the dimension of your tank and, secondly, the question of how the lighting should be mounted. It's recommended to take the length of the aquarium in centimeters as a guide for choosing the length of the matrix aluminium rail. The number in the model designation corresponds to the length of the aquarium (e.g. : for a tank with a length of 60 cm we choose the matrix 60.0). When it comes to mounting the light, daytime offers you a multitude of options. A universal bracket is already installed in the rail, in the shape of extendable pins. If you need an elevated rest, which further enhances the overall illumination of your tank, the swing adapter set is the right choice for you. Should you wish to install an LED system into T5 or T8 tube sockets that already exist, corresponding adapter kits are available. Open tanks could be equipped with a hanging light variation using a cable suspension kit. Bolt-on adapters or magnetic holders are a good choice for tanks with a lid. 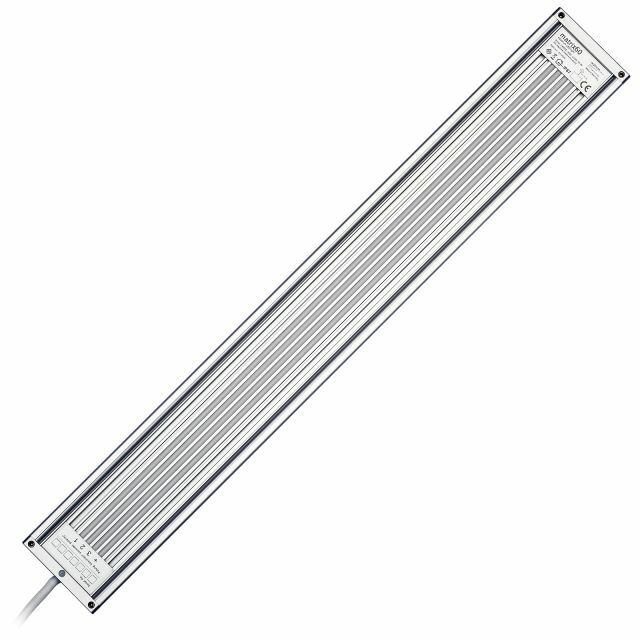 Precisely fitting guide rails are available for aquariums with covers made by Juwel or Eheim, which can accommodate the matrix lamp and replace the light bar and central part of the cover. The instructions can be found here: for Juwel or Eheim. When you know the length and with it, the model of the aluminium rail, you can go ahead with planning how to equip it with matrix modules. Please refer to our handy usage overview to see how many modules the respective rails can (and should) be equipped with. The modules need to be ordered separately. Installation is quite easy. You can shift the modules freely inside the rail and decide on the distance between the individual LED clusters. You can also take into account the constructional peculiarities of your aquarium, so that no module is placed exactly above a glass strut, no unplanted corners are illuminated, or you can give one area a particularly intense light. You can choose a specific light color for each module. Not only the position can be set individually, but also the color temperature. The following light colors are available: ultra white with 8,000 Kelvin, neutral white with 6,000 Kelvin, warm white with 4,000 Kelvin or Ultra Blue Red White. 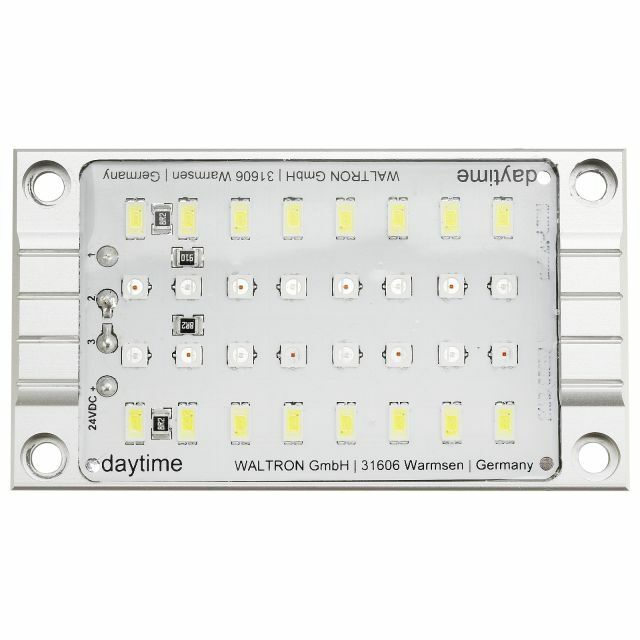 Here ultra white LEDs with 8,000 Kelvin are supplemented with red and blue LEDs. 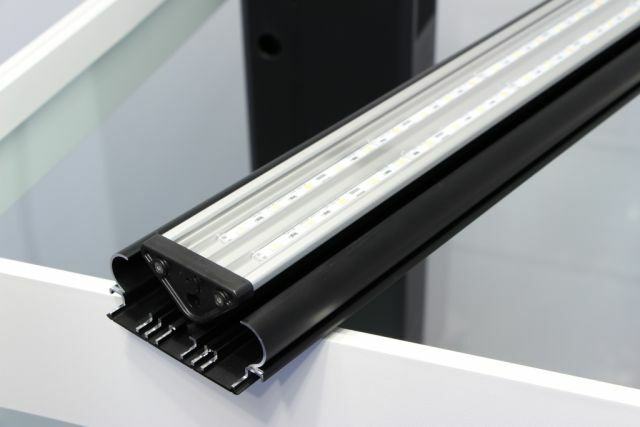 The more matrix modules you install on the rail, the higher are the performance and the luminous flux delivered by the LED lamp. Illumination is improved as well with a higher amount of modules. Last but not least, add the power consumption of the modules you're installing. Each module consumes around 10 watts. The sum of that will then tell you the required output of the power unit. Important: The rated output of the lamp must never exceed that of the power supply. If you want to install more modules later an, it makes sense to choose a power supply with a greater power capacity right from the start, which gives you more reserves. Now the basic configuration of your matrix LED lighting system is finished. If you need help assembling your individual lamp, we are happy to help. Please call or write an email.